The promoter said that one of his goals is to print parts requiring his fellow students for their work in the area of robotics. 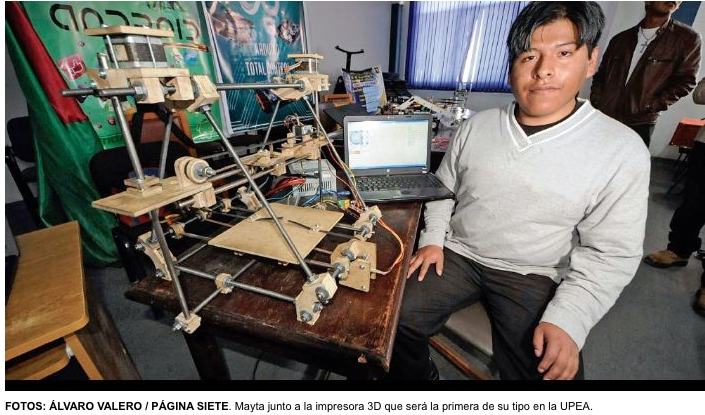 Aiming to create own parts for robotics development, a student at the Public University of El Alto (UPEA) built a three-dimensional printer that he assures will be the first of its kind to have this house of higher learning. Mayta Roberto is 24 years old and before starting his career in Systems Engineering already knew what would be its flagship project that would allow him to meet a life goal. “I found it great to create pieces. I had no knowledge of what was needed, but now investigating, and after all this time, since the technology allows you to do, I’m getting my dream,” he explains. Among the goals of the entrepreneur it is to build machines that contribute to scientific development in Bolivia. 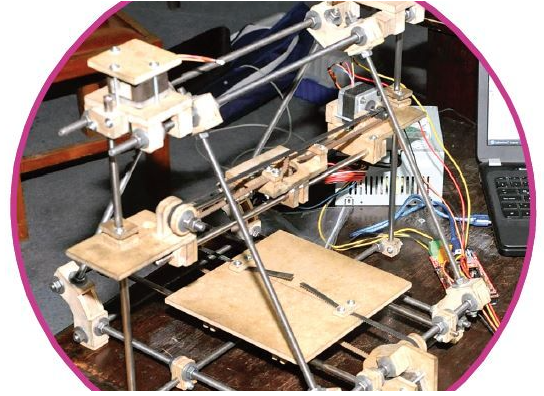 His current creation, 3D printer, has a pleasing appearance to the eye; pressboard underpins the device- has a neat finish, which assigns an air of “neatness.” Mayta says that before already tried to develop this type of creation in the UPEA, but those models “not see the light” because “before the technology was more expensive”. “Now, we’ve found an importer that brings all the elements we want and can complete projects. This will be the first functional 3D printer at UPEA” he says. The current prototype is -according to international standards- model 2012. Its creator says that the structure was built in about a month, and that the design of the pieces took two weeks. Regarding the electronic calibration, it took a week, while the suitability of the software, took an additional week. Currently this project is in “the calibration phase.” Mayta explains that this stage is very important because of the good results will determine the quality and accuracy of the pieces to be obtained in the future. The machine works with Arduino cards (specialized cards, open source for robotic programming and development). The mechanical part has rods, bolts and engines, mainly. For this, its creator has invested over 1,000 bolivianos (500 for electronics and over 500 for structural development). One of Mayta’s challenge is to develop parts for his fellow students of the UPEA, that demand when making their academic projects and research. This, as he says, nowadays, the development of humanoid robots, explorers, mechanical arms, etc. It is part of the university subjects. Therefore, this is one of the target audiences of the creator of the 3D printer. “After two months we would begin with the cloning of these printers. It would be something already in series. As research have developed, we will help to put it together. I want to replicate this machinery to make more sophisticated products,” he says. A country could not advance the technology if there were no people “off the charts” with great ideas and conduct. I do a lot of comparison with the great scientists who tried thousands of times to get something that existed only in his imagination and despite this, they got it. So, in this way, there are airplanes, light, electricity, alternating current, etc., it is a chain and progresses. Bolivia needs people like Roberto Mayta, there is no need to reinvent the wheel, we need to be proactive, using our available resources to be competitive. I welcome him to The Hall of Bolivian Fame! This entry was posted in Bolivia, Business, Economics and tagged competitiveness, innovation. Bookmark the permalink.